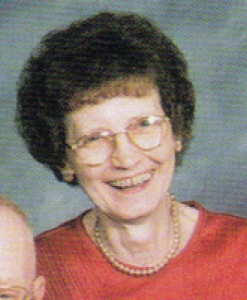 Hilda Leona Poeppelman, 83, Fair Haven Shelby County Home, 2901 Fair Rd., Sidney, Ohio died at the nursing home on Thursday, May 24, 2007 at 9:55 PM. She was born July 22, 1923 in Ft. Loramie, Ohio the daughter of John and Anna (Gaier) Aselage. They are deceased. She was married to Urban Julius Poeppelman on June 26, 1948 and he died October 10, 2001. Surviving are five sisters, Mrs. Ralph (Agnes) Francis of Versailles, Ohio; Mrs. Edward (Viola) Dietz of Botkins; Mrs. Marion (Esther) Dietz of Botkins; Mrs. Herbert (Clarissa) Barhorst of Russia, Ohio and Mrs. Cletus (Dorothy) Poeppelman of Sidney and one brother, Bernard Aselage of Fort Loramie. Two sisters are deceased, Josephine Doseck and Marie Francis and two brothers are deceased, Paul and Henry Aselage. Mrs. Poeppelman was a member of Holy Angels Catholic Church where she was a member of the Sacred Heart Sodality. She was one of the first members of the Schoenstatt Women&#39;s League and was in the VFW Auxiliary. She had been a homemaker. A Mass of Christian Burial will be held on Wednesday, May 30, 2007 at 10:30 AM at Holy Angels Catholic Church with Rev. Patrick McMullen. Burial will be at Shelby Memory Gardens, Sidney. Friends may call at Salm-McGill and Tangeman Funeral Home on Tuesday, May 29, 2007 from 4-8 PM and Wednesday, May 30, 2007 from 9-10 AM. Memorial contributions may be made to Fair Haven Shelby County Home, 2901 Fair Rd., Sidney, Ohio 45365 or Peter&#39;s Pense Religious Library, 209 N. Ohio Ave., Sidney, Ohio 45365. Envelopes will also be available at the funeral home.